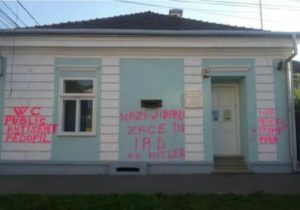 Unidentified individuals spray painted offensive graffiti on the external walls of a museum for Elie Wiesel in Romania, where he was also born, in what police said was an antisemitic incident. Wiesel was one of the world’s most famous Holocaust survivors before he passed away in 2016 at the age of 87. A Nobel prize laureate for literature, he was honored last year by locals in his hometown. They marched from the museum, which was built where Wiesel was born and grew up, to the train station where in 1944 he boarded with his family a train to the Auschwitz death camp in Poland. Police are investigating the incident, which they consider an anti-Semitic hate crime, but have no suspects in custody, the news site Sighet247 reported Saturday. A police officer told Katz he “did not see who was damaged” by the former mayor’s speech and that he therefore is dropping the investigation, Katz said.